He rules over every tick and every tock. "Staleek, he can wrap time 'round his little finger; the hoodoo-voodoo is not gonna work!" He may be a member of the Time Police, or the one winding up the Timey Wimey Balls, but as far as he's concerned, no-when is safe. If he's an antagonist, killing him may be difficult, impossible, or force Fridge Logic upon the viewer. After all, if he can move through time, can't he go back to before you attack him and kill you? Maybe, as a consequence of, or as a necessary condition for his power, he's a Time Abyss. Note that Time Travel itself is not a necessary power, and there are many characters with time powers that explicitly cannot travel through time. Not to be confused with a Time Lord. Or the Clock King (who might be called a time master in-universe, but isn't). Or the movie Time Masters. Kyoko from Time Stranger Kyoko. The Time Card in Cardcaptor Sakura. Sailor Pluto of Sailor Moon. Guldo from Dragonball Z has the ability to stop time for as long as he can hold his breath. Actually Fridge Brilliance, even if he himself is unaffected, the flow of air is not. Chao Lingshen from Mahou Sensei Negima, who possesses special bullets that can displace a target through time and has a fighting style that involves a lot of time travel abuse to evade attacks. Dio Brando's Stand The World as well as a number of other character could qualify. Dio's ability to stop time was kept a secret from his enemies, and he used it to perform all sorts of seemingly-impossible stunts. In the anime version, he made it look like things around him were exploding or tearing themselves apart because he willed it. Being able to stop time, if only for a few moments, made him virtually invincible. In fact, for quite a while the major villains of each arc had powers relating to time. Dio's The World could stop time, Kira's tertiary Another One Bites the Dust can invoke time loops, Diavolo's King Crimson can erase small spaces of time, and Pucci's Stairway to Heaven could accelerate the flow of time to unbelievable levels. Even Funny Valentine in Steel Ball Run, while not able to affect the flow of time, weaponizes the ability to travel between parallel timelines. Nagato Yuki in Suzumiya Haruhi is a Sufficiently Advanced alien with Reality Warper powers similar in nature to the Agents of The Matrix. Though incapable of physical Time Travel (she instead "downloads" her future mind into her past body in one instance, effectively making her the same person), she is capable of manipulating time and space, and helps a couple of time traveling friends who lost their time machine get back to the future by having them lie down in her guest bedroom and freezing time within said room while the outside world continues to move. This is Subaru's Seishi power in Fushigi Yuugi. Which she uses on her husband Tokaki and herself, reverting them to their younger selves for a while. She also casts a similar spell on her friend Tatara, allowing him to keep his youth as long as he stays in a determined place -- which suits him fine because he wants to live as long as possible to protect the Shinzaho. Ultear Milkovich from Fairy Tail has the ability age or restore inanimate objects. In Rave Master, Captain Hardner has an interesting way of using time related powers. Namely, restoring old wounds to people, and retgone'ing his own injuries. Midori Okamoto from Star Driver has various powers relating to time, including the ability to turn back time on her own body to become a teenager and see a few seconds into the future (just enough for her to dodge enemy attacks). Homura Akemi from Puella Magi Madoka Magica. Barragan Louisenbairn from Bleach. His abilities stem around manipulating the flow of time to slow down his enemies and make them age and crumble into dust. Magic: The Gathering has a select few cards that can, in fact, skip or repeat a player's turn. Some are guaranteed (being very powerful) and other are conditional (doing something X number of times, for example) or left to straight-up chance, like flipping a coin. An example of one such card would be Stitch In Time, from the Ravnica Block. For a specific character example, the Blue Planeswalker, Teferi, specializes in Time magic. The Time Wizard from Yu-Gi-Oh!. The anime typically portrays the card effects as the Wizard using its powers to rapidly age monsters to dust, although certain monsters can actually become stronger after a millenium or so. The D-Heroes also have traces of this as many of their abilities are connected with time (like sending enemy monsters into the future). Immortus in the Marvel Universe. Also in the Marvel Universe, any wielder of the Time Gem. The Time Trapper in The DCU. Rip Hunter is The Time Master. He uses his time machine to, in addition to fighting evil and learning martial arts, get the best soda of all time. The android Hourman, who was built with precognition and chronal manipulation powers on top of possessing a map of all space and time. Parodied with the D-list supervillain Killing Time in Empowered: he doesn't have any time powers, but really, really wishes he had. 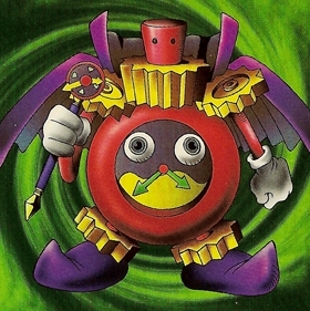 So he uses clock-themed gadgets instead - clock hands thrown as darts, a bolo made by joining the chains of two pocket watches, etc. Emp responds with her "mighty power over plant life"—that is, she beats him with a branch until he stops moving. Zero Hour villain Extant had loosely defined time control powers. He killed several members of the Justice Society by accelerating their aging to the point of death, and later he defeated Jay Garrick by regressing him back to an age before he acquired super-speed and became the Flash. The second Reverse-Flash/Zoom (Hunter Zolomon) does not have Super Speed, as he uses his temporal powers to fake having Super Speed to battle Wally with. Recent X-Men addition Velocidad was first thought to have Super Speed. This was disproven when Doctor Nemesis had him run across water... and he fell in, unable to move fast enough to not break the surface tension. Turns out he controls time in a localized pocket, giving him the appearance of super-speed outside but still subjected to the normal laws of physics inside. In Keepers of the Elements, Nasira, one of the Immortals is the resident Time Mistress. Wen the Eternally Surprised and The History Monks he founded. Lobsang Ludd, Time and Wen's son and heir. And Susan sto Helit, granddaughter of Death, can move through time and stop other people's time. The ChronoGuard and Colonel Next in the Thursday Next books. In Percy Jackson and The Olympians, the Big Bad Kronus is the Lord of Time. Even without his full power, as he is through the series, he can distort time to slow down his enemies. While technically any of the Travelers in The Pendragon Adventure can travel through time using the flumes, Saint Dane and Nevva Winter can control their exact destination in time with them. In the Sorcery! gamebook series, each of the Seven Serpents has power over one aspect of the universe. Their leader is the one with power over time. Norton becomes Chronos, the incarnation of time in Bearing an Hourglass, the second book in Piers Anthony's Incarnations of Immortality Series. The Old Ones in The Dark Is Rising series seem to be able to do this, to some degree. Yog-Sothoth, from the Cthulhu Mythos, isn't just a master of time - it IS space-time. In Doctor Who, the Time Lords can't do this, at least not without the aid of mechanical devices, with the following exceptions: in Invasion of the Dinosaurs, the Doctor's Time Lord nature provides immunity from time disturbance. In "The End of the World", the Doctor shows that he has a perfect sense of timing, and that he can slow down his perception of time itself. In the Doctor Who Expanded Universe, trained Time Lords can do this on a small scale, reaching a few seconds across time, usually for combat purposes, and the Celestial Intelligence Agency has operatives who can stop time, or jump a billion years, by willpower alone. But of course, when they have their technology with them, they will prove exactly why they are called the Time Lords. Bilis Manger from Torchwood embodies this trope. Sapphire can wind back time. Apart from that, Sapphire and Steel's enemies (which includes, arguably, Time itself), commonly can distort and manipulate time. Also from Heroes, Peter Petrelli, who copied it from Hiro, and Arthur Petrelli, who stole it from Peter. Besides being Time Masters, all three can also teleport as a result of controlling the space-time continuum. Dr. Tom, the psychiatrist in Being Erica, seems to have this ability. He not only sends the protagonist Erica back through time but then appears in her history, be it as a hot dog vendor, repairman, street performer, etc. so she can continue to consult with him. The demon Tempus on Charmed could create Groundhog Day Loop s and rewind time. And later the Avatars and The Cleaners also had time manipulating powers. Illyria from Angel can slow down time, effectively giving her Super Speed. She doesn't appear to be capable of time travel, until her powers start to malfunction and she starts jumping through time uncontrollably. Einstein in Farscape. Quite apart from having power over wormholes which can allow passage through both time and space, he can handily stop time whenever his guests start getting disagreeable. Fate from Supernatural. She uses this power to cause overly elaborate, almost cartoonish deaths. Kazu of the Heaven Time Star, the KirinRanger from Gosei Sentai Dairanger has time-rewind powers. Every player character in Continuum. Both Mage: The Ascension and Mage: The Awakening feature the Sphere/Arcanum of Time, which allows perception of the past/future as well as manipulation of the flow of time. Mage: The Ascension has it as a specialty of the Cult of Ecstasy (a Tradition that uses ecstatic measures to enter an altered state of perception), whereas Mage: The Awakening has it as a specialty of the Acanthus Path. The Time Lord NPC class in Dragon magazine #65. The Time Elemental in the 1st Edition Monster Manual II. Istus, goddess of Fate in the World of Greyhawk. The Kanohi Vahi in Bionicle gives this power. Link in Oracle of Ages (to past and present), Ocarina of Time (between child and adult) and Majora's Mask (going back to the beginning of the game, slowing time, speeding up time, etc). The titular "achrons" in Achron are Time Masters. Players can pause time, slow it down or speed it up, jump to alternate moments in time and generally observe the entire timeline (timewaves and all). This makes them ideal generals for commanding armies in cross-temporal warfare. Time Lord in SaGa Frontier. Due to the game's lack of Gameplay and Story Segregation, there isn't anything stopping him from freezing time and attacking you. When the Titans shaped Azeroth, they chose five breeds of dragon, empowered each of them, and gave them dominion over certain aspects of the world. The Bronze Dragonflight was charged with guarding Azeroth's timeways. Bronze dragonflight questgivers meet your character and get confused about whether they have met you before, they send you to important times in history so you can stop someone else from screwing them up, and their leader is long-missing and is implied to be a bad guy now. Speaking of which, their leader, Nozdormu, was even granted knowledge of the exact place and time of his own death, so fighting him would be completely stupid. As soon as the fight goes poorly for him, he will just restart the fight from its time of origin and try a different tactic. Pokémon has two mons with Time powers: Celebi who can travel through time, and Dialga who is essentially the deity of time. In the second Pokémon Mystery Dungeon game, Darkrai can travel through time as well. It sort of makes sense, since he could learn Roar of Time in a special event in the main games. St. Germain in Castlevania: Curse of Darkness, though he may be unable to affect anything. Aeon from Castlevania Judgment is a more normal example, then there's Zephyr from Dawn of Sorrow, and the Chronomage Unique Enemy. The Big Bad of the Freedom Force series is literally named Timemaster. He's essentially a Galactus analog with power over Time instead of Cosmos. He is only incapable of controlling his own aging process, so he plans to gain immortality by literally destroying time itself, with the unfortunate side effect of killing everything in the Universe except him, something which doesn't seem to bother him much. He also has the problem (for the heroes) that he can, at any given time, revert himself to when he was at his most powerful, making it impossible to defeat him. In the end, only extremely powerful Applied Phlebotinum or the aid of the Anthropomorphic Personification of Chaos is able to make him stay down. Sakuya Izayoi, Touhou's resident time-stopping, knife-throwing Ninja Maid. Very useful for speeding up housework. In her "Deflation World" spellcard, Sakuya pulls both the future and past versions of each knife she throws into the present, in effect forming lasers made out of knives. There is another character with (more subtle) mastery over time: Kaguya Houraisan. Her power control the rate of flow of time, dubbed "power over eternity and temporality" (think Bullet Time). Which saves her from boredom, since she has Immortality. There are WMGs about how she and Sakuya are connected. Richard Wong of Psychic Force. Emiya Kiritsugu of Fate/Zero is a more restrained version of this. He has a magecraft called 'Innate Time Control' which allows him to internally affect time - speed it up for superhuman reaction time in combat, or slow down his bodily functions to avoid a search-and-destroy system. However, whenever he reverts to normal time, his body is forcibly 're-synced' to the time of the World, which can cause very heavy internal injuries. Luxord from Kingdom Hearts has this as his element. He never seems to do anything useful with it. It sounds a lot cooler than the element of Compulsive Gambling. On the other hand, the Mysterious Figure from Birth by Sleep demonstrates how a time-wielding boss is done right. One of his tactics involves stopping and rewinding time to recover HP, even reversing the BGM. He has more time-related tricks when he shows up in Kingdom Hearts 3D, some of which border on Interface Screw. Kamui of Arcana Heart has the Arcana of Time as her default, letting her freeze opponents in time, move at Super Speed, and use time-delayed copies of herself to evade and add to attacks. Also, as a side-effect of her Arcana, she's Really Seven Hundred Years Old. The Time Mage class from the Final Fantasy series. Viewtiful Joe can speed up or slow down time, though it's explained in-game as 'visual effects', as the game takes place within a movie film. Flash Man, Bright Man and Time Man from the Mega Man series all have weapons that can either slow or stop time. This is the only power the protagonist from Braid has, and it gets put to many fascinating uses. Moebius and his predecessors in Legacy of Kain, the guardians of time, who are among nine sorcerers chosen at birth to guard different aspects of the world. Time technology shows up a lot in Command & Conquer: Red Alert, with the original breakthroughs made by Einstein. Red Alert 2 introduces the Chrono Legionnaires, who can teleport around and erase other units from history. In the original manual, it's implied that the chronoshift teleportation is actually a case of Time Stands Still while the unit travels across the map the normal way. In World of Warcraft, the Bronze Dragonflight are a benign example, trying to maintain and preserve the timeline of Azeroth; their enemies the Infinite Dragonflight are more malevolent, attempting to Make Wrong What Once Went Right for some unknown reason. Blinx and his fellow Time Sweepers. Tales of Monkey Island: LeChuck near the end of Chapter 5. When he sees the Vaycaylian warriors throwing their javelins at him at Winslow's order, the villain uses his voodoo power to make Time Stand Still for those outside of LeChuck's ship, making the entirety of the ship seem more like a parody of Year Inside, Hour Outside. Strangely enough, the Crossroads (and Morgan LeFlay for that matter) don't seem to be affected by the voodoo time freeze. A possible explanation for that is found in Chapter 1; the Voodoo Lady mentions that the Crossroads are the source of all voodoo power (or something like that), and as such are probably immune to voodoo being used as a weapon against them. Sonic the Hedgehog has this power, but doesn't use it very much (if at all). His rival, Shadow the Hedgehog, uses it much more often, to the point where it can be considered a part of his Elemental Powers. The resident Kid From the Future, Silver the Hedgehog, doesn't have this power naturally, but is only relevant to the plot when he time travels. Zilean from League of Legends holds the title of Chronokeeper, and he lives up to it. He places time bombs (literal ones) on targets that detonate a while later, can rewind time to reduce his cooldowns, and can speed up or slow down time around champions to increasing the movement speed of his allies or decreasing his enemies'. His ultimate ability puts a protective sigil on an ally that will rewind time around them if they die, essentially resurrecting them if they die while the sigil is active. Early-game, his time bombs make him a great nuker, but as the game goes on, he tends to do better in a support role. City of Heroes has this as a Buff/Debuff set. It's considered one of the best in terms of performance. In Space Channel 5 Part 2, the Japanese version mentions that Purge has the ability to bend spacetime. Chrono Trigger's Big Bad, Lavos, seems to have some influence on time given that his final boss battle takes place against a backdrop that changes to scenes spanning history. His evolution in Chrono Cross, the Time Devourer, has enough control over time to render himself undefeatable by normal means - if you kill him, he'll just bring in a copy of himself from an Alternate Timeline where you didn't. Dr. Nefarious Tropy, the self-proclaimed "Master of Time" from the Crash Bandicoot series. In Red vs. Blue, Gary/Gamma's special AI ability is to manipulate time. The Meta steals it between Blood Gulch Chronicles and Revelation. Dan from Trinton Chronicles has control over time including accelerating, deaccelerating, and stopping time. As a bonus he gained light and dark generation and control which gives him the bonus abilites to age/de-age (from light) and restore/degrade (from dark) people and objects. Word of God says there is no time travel in the Whateley Universe, but Stopwatch has the power of temporal warping. He can speed up his own personal time until he's effectively a speedster, or he can slow down someone else's time while he moves at a normal rate. Time is one of the powers available to Sburb players, and one of the two which must occur in every session. Dave Strider is the Knight of Time in the human session, and Aradia Megido is the Maid of Time in the troll session. Both are in charge of timeline management - using their powers to establish and take advantage of stable time loops to ensure things proceed as they must, and to provide a way to avert bad futures should things go wrong (which they have... often). Both use music-themed Magic Feathers to travel through time - Dave uses turntables, while Aradia uses music boxes; after ascending to the God Tiers, Aradia is strong enough in her time powers to freeze Jack Noir in time without any assistance, however temporarily it may have been. Also, both their Lands house the item necessary to initiate the Scratch, itself a massive burst of time energy. The Felt each have a different power that allows them to manipulate time or perceive things in the past or future. Well, except for Biscuits, whose "power" is hiding in an oven that he thinks lets him time travel into the future. Technically true, even though he's just traveling at the same rate as everyone else. Wayward Sons: Nysus can speed or slow time in a localized area. He first used it to rapidly ferment wine. Elita One from Transformers Generation 1. And Vector Prime from Transformers Cybertron. Paradox from Ben 10 Alien Force. The Xelor class in Wakfu are time mages, and casually do all of the associated tricks, except for the aforementioned Time Travel. The main villain goes to some unsavory lengths to try and prove that last part wrong. Parodied on Johnny Bravo with Chronos, Master of All Time! *Dramatic Thunder*: A talking Grizzly bear who had dubbed himself Master of All Time! *Dramatic Thunder* due to having stuffed his cave full of watches that he all meticulously kept precise time on. Well, except the VCR clock. That one was beyond even his vast and immaterial powers. This page was last edited on 18 October 2018, at 17:42.